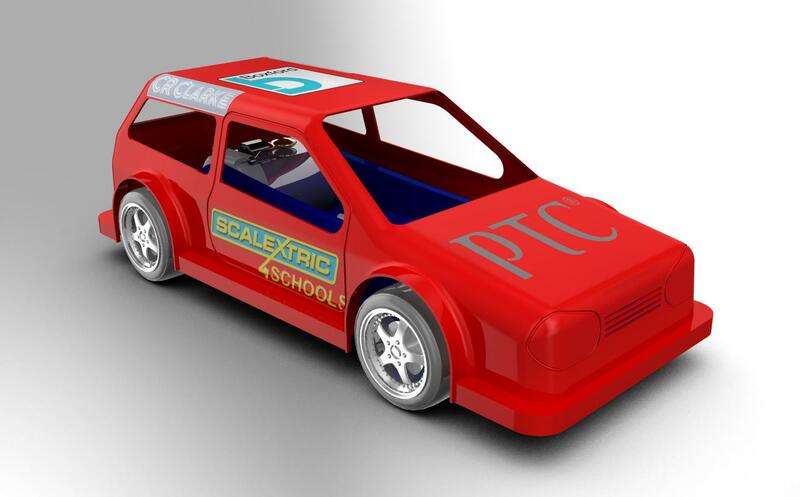 The very first Scalextric4Schools prototype had a sidewinder motor layout. To fit everything in we used 2mm acrylic sheet. Early in the development of the challenge we moved to using inline motors as this layout is much easier to build. While the inline motor layout has been standard for the online introductory tutorial and classroom use, many of the teams entering the competition and nearly all slot racing enthusiasts use the sidewinder motor layout. Responding to this we have updated the PTC Creo model which can be downloaded using the link below. We now have a sidewinder layout car with 3mm acrylic chassis. The ZIP includes a DXF file for cutting the chassis and an STL file for machining the body mould. If you want to 3D print the body increase the shell thickness to suite the minimum thickness your machine will create reliably. Build the body upside down to reduce the amount of support material. This model has a body shape with wheel arches that are easily removed using a belt sander.